For other people named Charles Adams, see Charles Adams (disambiguation). Charles Adams (May 29, 1770 – November 30, 1800) was the second son of President John Adams and his wife, Abigail Adams (née Smith). At the age of nine, he traveled with his father and older brother John Quincy to Europe, studying briefly in Passy, Amsterdam, and Leiden. He matriculated in Leiden on January 29, 1781. In December 1781, Charles returned to America unaccompanied by family members. After graduating from Harvard University in 1789, he moved to New York City, where plans had been made for him to work in the legal office of Alexander Hamilton. 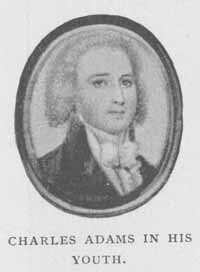 Shortly after, however, Hamilton was named Secretary of the Treasury and Adams moved to the law office of John Laurance to continue his studies. Adams passed the bar examination in 1792. On August 29, 1795, Adams married Sarah "Sally" Smith (1769–1828), the sister of his brother-in-law, William Stephens Smith. They had two daughters, Susanna Boylston (1796–1884) and Abigail Louisa Smith (1798–1836). Abigail married the banker and philosopher Alexander Bryan Johnson; their son Alexander Smith Johnson would become a judge. At the age of 37, Abigail Louisa died of uterine cancer. Adams was an alcoholic who engaged in extramarital relationships and made questionable financial decisions. He was disowned by his father and sometimes lived apart from his family. He died in New York City of cirrhosis of the liver on November 30, 1800. In 2008, HBO presented the miniseries entitled John Adams based on the book by David McCullough. This biographical presentation depicts President John Adams as a neglectful father to Charles Adams, and suggests that the elder Adams's failures as a father negatively influenced Charles's development. Historians, however, have pointed out the inaccuracies of the series' representation of their relationship. ^ "The Adams Children". American Experience. PBS. Retrieved 20 July 2014. ^ Album Studiosorum Academiae Lugduno Batavae MDLXXV-MDCCCLXXV, kol. 1136. ^ Index to English speaking students who have graduated at Leyden university / by Edward Peacock, F.S.A. - London : For the Index society, by Longmans, Green & co. 1883, p. 2, 1136. ^ Kaplan, Fred (2014). John Quincy Adams: American Visionary. New York: HarperCollins. p. 100. ISBN 9780061915413. ^ "Lives of the First Ladies". This biographical article related to politics in the United States is a stub. You can help Wikipedia by expanding it. This page was last edited on 10 April 2019, at 05:12 (UTC).